The Office of Student Affairs, with the support of Guidance and Counseling Center and Discipline Office will hold a forum entitled: The Psychology of Bullying and the Must-Know Legal Provisions for Guidance Counselors and Discipline Practitioners. 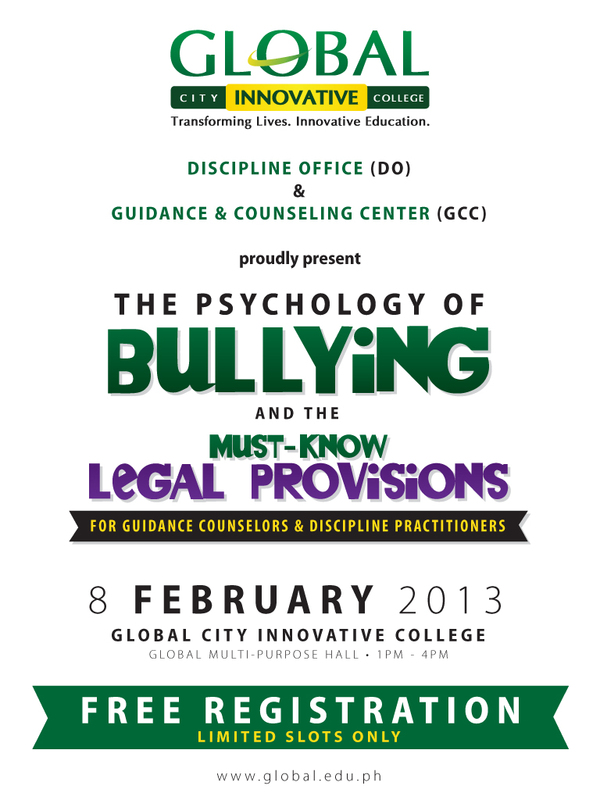 The event will be held at the Multi-Purpose Hall, Global City Innovative College, 3rd floor Bonifacio Technology Center, Bonifacio Global City, Taguig City on February 8, 2013, Friday, 1:00 pm. Interested parties may contact us at 757 5588 loc. 839 (Guidance Counseling Center) and loc. 832 (Discipline Office). Registration is FREE. LIMITED SLOTS ONLY! This entry was posted in Uncategorized by GCICph. Bookmark the permalink.